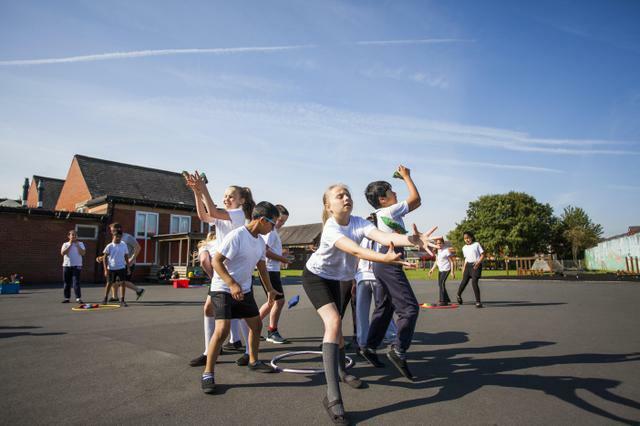 Schools are allocated a sum of money, called the Primary PE and Sport funding, to support all children and improve the quantity, quality and breadth of PE and sport provision. The allocation is calculated according to the intake of the school, and the school must decide how best to use the money to improve the breadth and quality of PE and sport provision, including increased participation in PE and sport so that all pupils develop healthy lifestyles and reach the performance levels they are capable of. We have used our sports funding to employ a specialist sports coach from AFC Fylde who worked closely with class teachers to up-skill our teaching and provision. AFC Fylde support school to provide exciting P.E provision throughout school. Coach Dan also works closely with the children, supporting well-being and positive mental health through small group activities with children identified by school. Coach Dan has supported school in altering the way our lunchtimes run and provides a variety of lunchtime sporting activities that the children can opt to take part in. Any child can take part during their lunch time and can opt in at any point during the first 2 session of lunchtime. For the latter part of our lunchtime, all welfare staff run play zones where children who have chosen to spend their 20 minutes of Zone play, take part in a variety of enrichment activities. To support with the Zone Play, some money has been allocated to improve sporting resources to provide a high quality experience for children and to enable staff to enrich playtime provision. We use AFC Fylde to also provide after school clubs which are heavily subsidised by school using the Sports Premium Funding. Below is our current sports funding action plan review for 2018-19.